I am working on a new writing project, set in Alberta during the 1920’s and 1930’s. I spent much of the fall immersed in research. Delving into Alberta’s history has been really fun (yes, I am a librarian), and I find myself with more interesting information than I will ever be able to use. Instead of saving it all for cocktail parties, I’ve decided share some of it here from time to time. Today’s tidbits come from the Heritage of Service: The History of Nursing in Alberta, by Tony Cashman (Alberta Association of Registered Nurses), which I was reading because one of my characters is a nurse. She gave the anaesthetic for the man who had the abscess at the base of his skull, and she had a large audience because the man and his many relatives agreed to the operation only on condition that all the relatives could come and watch. Patient and family were not in favor of the surgery because they thought the doctor was going to operate on the man’s brains. There was intense silence as Dr. Archer opened the abscess and began to remove the infected matter. Then the Archers nearly lost their professional composure as a large lady relative sighed: “Poor fellow. He never had much brains to begin with” (74). There was a tiny kitchen. If an operation came up, we would have to move the patients out of the front room, then clean it up to the best of our ability before operating. 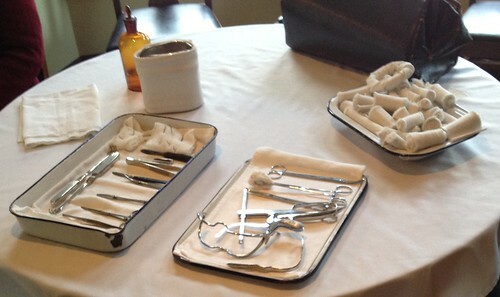 We had an antique sterilizer which we used, sort of a double-boiler affair the size of a large pail. This we set on the stove to sterilize our dressings. 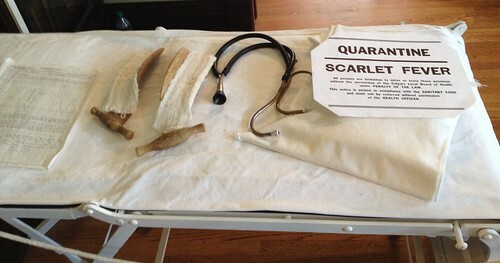 It was some job and we had no assurance they were sterile. We had to finish them off by drying them in the oven. This was a great worry to me; a far cry from our electric sterilizer in Medicine Hat. The X-ray room was my broom closet. I took most of the X-rays. ….The babies were kept in baskets in the kitchen by the stove and were bathed on the kitchen table (Mary Cody, describing the Cereal Hospital, page 132). One of these self-trained nursing aides was once out assisting in a maternity case in a cabin where the mother had used all the available flour sacks to prepare one layette. That would have been all right if there’d been only one baby, but a second arrived unexpectedly and this baby really came naked into the world because his twin brother had all the clothes. So the helpful lady asked Dr. Chisholm to turn around for a minute, a minute in which she took off her slip and made the newcomer presentable (223). Miss Willis wrote: “No course can equip us with ready made rules for all contingencies. What to do, for example, when at the moment of delivery you turn to your table for an instrument and find a kitten of whose existence you were previously unaware, intimately inspecting your sterilizing gear” (242). 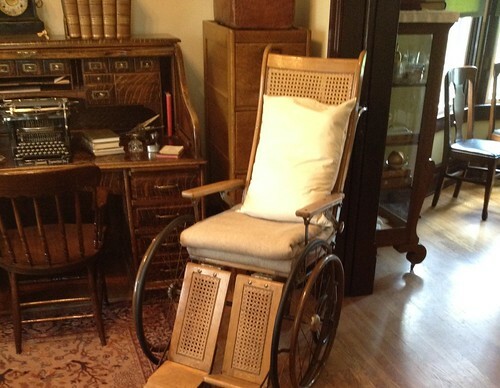 The photos in this post were take at the Cottage Hospital in Heritage Park, Calgary, Alberta. I read Heritage of Service in the Heritage Room at the Stanley A. Milner Branch of Edmonton Public Library. I discovered these dishes in the Vindolanda Museum, along Hadrian’s Wall, and have been thinking about them ever since. 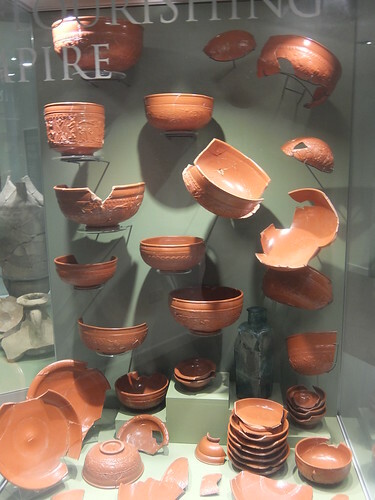 This almost-complete set of Samian-ware pottery was imported into Roman Vindolanda from France and, after being broken in transit, was thrown away, unused, into the ditch of the fort. Imagine the disappointment of the intended owner – and the thrill of the archaeologists who found these dishes almost two thousand years later! Who were these dishes intended for? 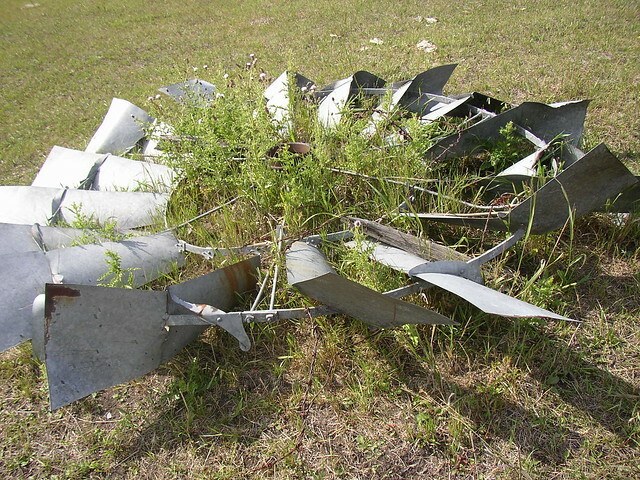 Did whoever ordered these dishes get a replacement set? How long did that take? How much did it cost? Not all the dishes are here… does that mean a few of them arrived intact? If so, what happened to them? Where they given to a slave or someone else, or did the owner keep them? birth. Our family’s firstborn Canadian. unable to understand your parents. my past beneath this holy, expansive sky. 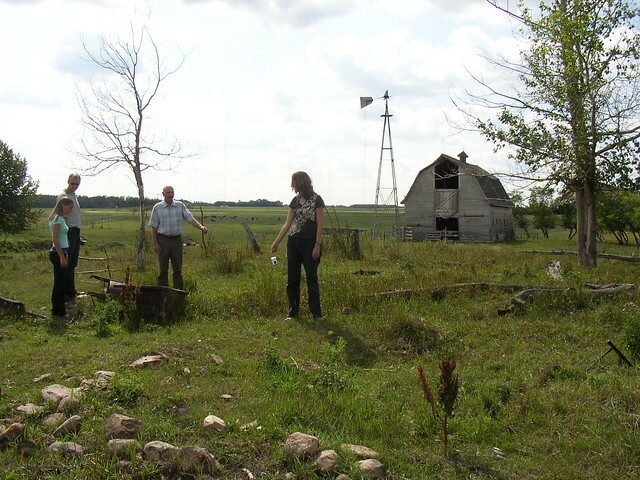 Dad shows my brother, sister-in-law and I the layout of his grandparents’ house near Ellerslie, Alberta. Photo credits: Gladys Kublik, 2009. Sounds romantic, doesn’t it? I can imagine watching dense forests and ripe wheat fields pass by while sipping a glass of wine a the luxury restaurant car. During a recent visit to Calgary’s Heritage Park, I was reminded that all of my great-grandparents, and three of my grandparents, made this trip in much different conditions after landing as new immigrants in either Halifax or Quebec City. Each of the four families arrived in Canada planning to continue on to Alberta, to settle near family members already living near Ellerslie or Wetaskiwin. 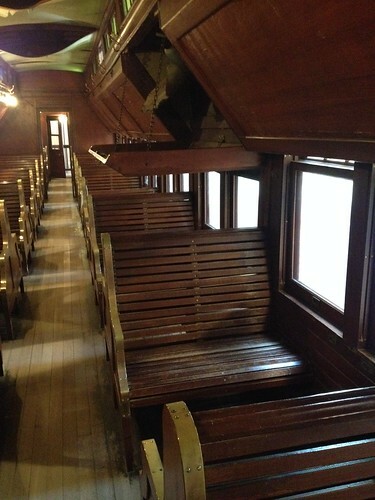 And each of the four families would have made that journey in a train car similar to this one. 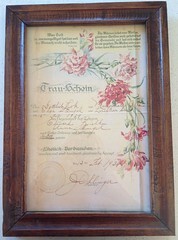 The sign outside the car pointed out that “these second-class cars, with their wooden slat seats, cookstove, and tank of water, provided necessities rather than comforts.” Even so, for the Stengel family, which included my grandmother Olga (then an infant), the $7.00 fare per person – even if the children rode for free – would have been a significant expense, considering that the family had only $60.00. I doubt they would have splurged the additional $2.50 to purchase bedding for the sleeping berth. 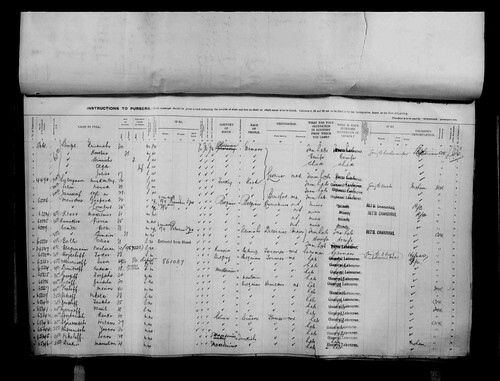 What did my great grandparents, Karolina and Frederick, think about as they began to realize the immensity of their new country? Did they voice their thoughts to each other? Where they excited? Hopeful? Frightened? I’m certain I would have been all of the above. I love to travel, but I wonder if I would have had the courage to leave family behind and move halfway across the world, never to return “home” again. Even as that question enters my mind, I know it is not a fair comparison: they had very little to lose when they left Volyhenia, Russia, to come to Canada. So he sold the two cows that hadn’t died during the winter and bought tickets for the five of us: Frederick, his younger brother Julius, me, Henry who clapped his hands in excitement when we told him we were going on a ship, and the baby. I thought I would die in the belly of that ship, the Hesperian, as it belched smoke across the Atlantic and I lay curled up on our cot, seasick, while Henry toddled around playing with the other children. Through the rich farmland into the barrenness of the prairie where no trees grew, and still we kept going. We kept going until we came to Edmonton, where his brother waited to take us on to Millet, the brother who had lots of room. So I cleaned out the shack with a pitchfork and I swept and I washed and I begged some paint from the brother’s wife and I painted. And we called it home. I waited for a better life. But there was no free land, not here. To get the land we would have to travel far away from the towns to where there was no one. We would have needed supplies: horses, seed, a plow. The money from the cows was already spent. I wasn’t sorry we had come. What was there for us in Russia? Nothing, not even the house we had lived it: the landlord’s men tore it down the morning the lease on the farm ran out. Frederick’s family had farmed it for ninety-nine years, but the only land they owned was the bit that was caught under their fingernails. That first year, he would come home, his shirt soiled with sweat from the long hours in another man’s field. He would sit at the table, head in his hands, too tired to eat the supper I had cooked hours before. We would sit on the step, our children asleep inside, and look at the stars, dreaming of a farm of our own.